Supplementary material reads: "Sandusky. Illus. West Los Angeles. Three persons were taken to Santa Monica Emergency Hospital following a two-car accident at Kirkside Road and Beverly Drive, West Los Angeles. 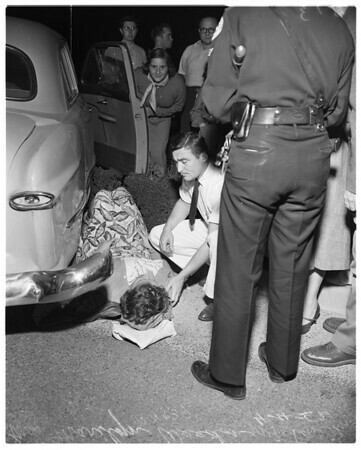 Most seriously injured was Mrs. Marilyn Weedin, 24, 315 S. La Peer Drive, Beverly Hills, who received a fractured collar-bone and was removed to Beverly Hills Clinic. Mrs. Weedin was driving one of the cars involved. She had no passengers. Driver of the second car was Sid C. Eder, 17, 615 North Camden Drive, Beverly Hills. Both he and his passenger, Ronnie Lee, 17, 9706 Cresta Drive, West Los Angeles received minor injuries".